The moon has water on it. Lots of water, according to scientists. "It's a thrilling discovery that sent a ripple of hope for a future astronaut outpost in a place that has always seemed barren and inhospitable," Anthony Colaprete said yesterday. A NASA spacecraft that crashed into a crater, has photographed water on the moon. "Indeed, yes, we found water, and we didn't find just a little bit, we found a significant amount," Colaprete said. It never ceases to amaze what science and technology can accomplish. Here's yet another amazing photo. 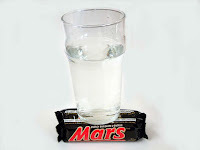 The first picture from NASA of water on Mars. Outstanding! Great news. Really interested that they can find water on Moon. Is the water going to be drinkable?? Can they pipe it to Bligh County?